If you are anything like me you will often need quick and cheap ideas for jazzing up or decorating a room ready for a party or gathering. 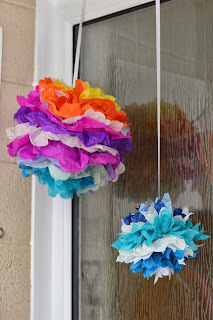 These fun tissue paper balls were made up in no time at all for a cost of less than £1 each. I made them whilst the children were at school, but I do think they would have a lot of fun making them with me in the future. 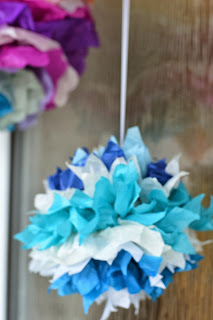 Layer up the tissue paper on top of each other. I have made two, the first one (pictured) has 14 layers of mixed colours, the second one (smaller one, above) has 12 layers, and I deliberately choose similar colours of blues and whites which I think look a little classier. Concertina the layers together along the width of the paper. Press down hard to make sure the tissue stays together. Tie a long length of ribbon in the middle of the tissue paper with one long length of ribbon. You should make sure this is tight and secure. Cut the ends of the tissue paper in a round shape using sharp scissors. On the smaller ball, I cut the ends in a V shape, which I think works better. Now turn the tissue on its side and carefully lift each layer of tissue up as gently as you can. It is important to do this one layer at a time. The tissue is delicate and it is easy to get cocky and be too heavy handed. Go careful because if it rips it could spoil your decoration. Once you are half way through your layers begin doing the other side. At this stage it will begin to look like a flower. Turn the shape over and start again on the other side of the decoration. You will begin to form your shape into a ball. Feel free to ruffle your shape by scrunching the tissue layers. This will add even more shape. Once you have undone each of the layers you have finished. Find the end of the ribbon and hang it up as desired! I would suggest that these would be wonderful decorations for Christmas, Valentines day, Easter, Birthday Parties etc and really are quite addictive to make…have fun!